Back again for another Webseries Wednesday, and there’s another brand new episode of CW’s Vixen over on CW Seed. Once again, there’s no embedding so if you’re interested in watching the five minute episode 2 go ahead and click the link below. Last episode brought up a lot of questions about Vixen, a character that I knew nothing about and I still know very little about. This episode answered only a couple of those questions while still leaving much on the table for future episodes, it also introduced what’s likely to be the villain of the season even though all we get to see of her is a mouth. This episode shows what may or may not be the first time that Mari uses the powers of her necklace. We do get a flashback of when she was first given the necklace by her foster parents, we also learn that she was given up as a baby without even a name of her own, only this necklace. The only other thing that she knows about it is that it is a totem of Anansi, the African trickster god. Without having any other information, I would go out on a limb and say that he was probably DC’s version of Marvel’s Loki. She has had this necklace since she was around 9 or so, but there’s not really any indication of whether or not she actually was using it for the first time here or not. There’s a bit of a misdirect where she goes to this professor who more or less gives her, and the audience, the basics of what the necklace actually does for her. It gives her the abilities of whatever animal she conjures. But after she leaves, the reveal is that he is working for an unidentified woman who hired the thugs from the cliffhanger ending of episode 1 which she handily took out at the beginning of this episode. Again, I’m completely unfamiliar with Vixen as a character so I have absolutely no guesses as to who this character is aside from the fact that she’s quite likely a villain. It’s also still a little tough to get used to these types of serialized webisodes because there’s so little to go on for each episode that it’s a lot harder to get a grasp of the whole picture. 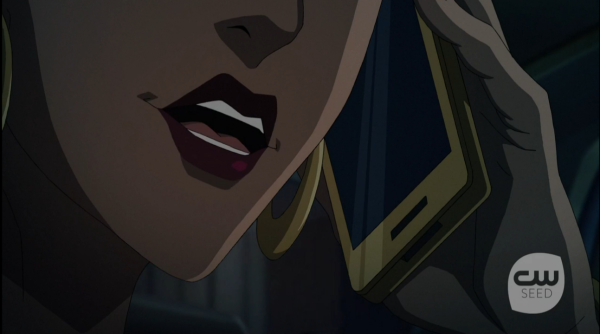 It does look sharp, the animation is quite gorgeous in places though I would expect no less from DC Animation, and it does seem to give just enough to make me want to tune in next week to get the next piece of this puzzle. So in that respect, it’s working quite well.